Ilizarov method is generally used to correct limb deformities. The Ilizarov technique is based on the principle of Distraction Osteogenesis. According to this principle, the concerned bone, is strategically cut (osteotomy) into two, pulled apart in a controlled manner(distraction) with the help of an external device commonly referred to as Ilizarov apparatus named after the doctor who used it for the first time. 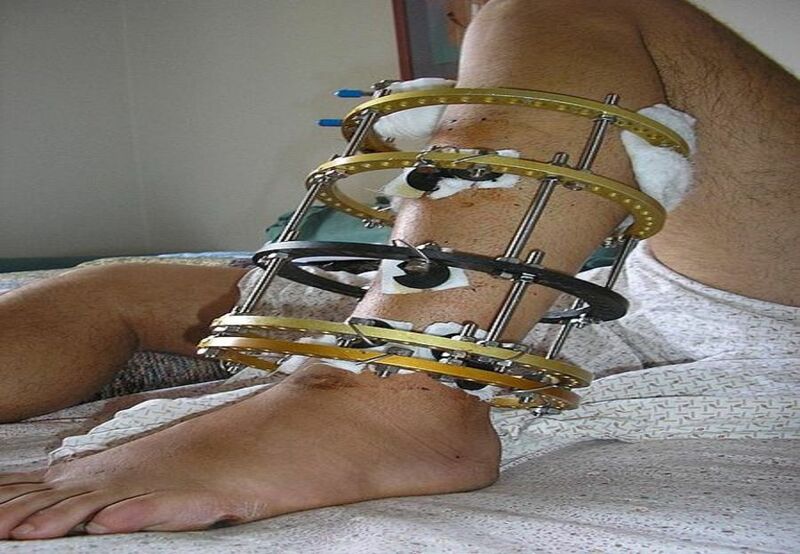 This device consists of metal rings, rods and wires that encircles the limb in such a way so as to pull apart the broken ends of the bone in a controlled manner usually at the rate of 1mm/day and this stimulates the formation of new bone naturally over a period of time and so its nerve and blood supply. The best part of this technique is that it permits a person to lead a normal life despite a fracture. Birth defects of the lower limbs that need both lengthening and correction of angular deformities. 1.Distraction– This stage commences 5 to 7 days after surgery. Most favourable distraction(controlled pulling apart of bone’s cut ends) is done at a rate of 1mm/day, 0.25 mm every 6 hrs, until the required length is procured. For eg. for lengthening of 5 cm, time would be 50 days for distraction. 2.Consolidation (Hardening)– This phase involves the hardening of the newly formed soft bone. This time is twice the amount of time taken for distraction. Time is nearly 1 month for each 1 cm of lengthening. Therefore for 5 cm, time would be approximately 5 months. During this time external fixator remains at its place and only removed once the newly formed bone is strong enough to permit its removal. 3. Removal of the external fixator or frame Xrays and clinical examination are the usual methods carried out to evaluate the strength of the new bone in order to decide the best time to remove the frame. The best time for removal of the frame is when the xray shows that the newly formed bone has bridged the gap completely and cortex has been formed at the lengthened region. Then connecting rods of the external fixator are removed under General anesthesia and the strength of the bone is clinically examined. The external frame is completely removed only when the bone is considered solid enough to do so. Eventually, cast or brace is applied on the surgical site for another 4 to 6 weeks. 4. Rehabilitation Limb rehabilitation is initiated after the cast or brace is taken off. range of motion and strengthening exercises are advised as part of physiotherapy. This stage last for couple of months. SCAN AND SEND YOUR MEDICAL REPORTS TO GET ABSOLUTELY FREE MEDICAL OPINION FROM TOP ORTHOPEDIC SURGEONS AT WORLD CLASS HOSPITALS OF INDIA ALONG WITH TREATMENT COST ESTIMATE FOR THE SAME.